26.2 Quest: I Am Running With GU - Do You Want To? I Am Running With GU - Do You Want To? If you have trained for and run a half marathon or rocked the 26.2 I am sure that you have heard of GU Energy. I have used GU over the years for the multiple endurance events I have run in, but I have also tried other brands and other products to make sure what I am using is giving me the best energy and sustaining power for those long runs. When you get to that distance where a little something extra is needed to keep you going it is amazing how much different each product can be. Each time I have been there I have noticed a definite increase in energy shortly after using the GU's I brought along to get me through the run. As I mentioned earlier I have tried other products. Some other products have also given me a similar boost, but I can honestly say that there were many that left me wanting more..... much more! Of the different brands that did give me the boost that I needed I have to say that GU was the easiest to carry, and easiest to open, especially following that 15-18 mile mark when my energy was really starting to be a precious, yet waining, commodity. I am generally a very plain consumer. When I find something I like as far as flavor I usually stick to it. In the past when I found a somewhat plain GU flavor that I liked you could find me at the local running store with a half dozen or more of them in hand. Recently I was given the opportunity to try a sampler pack of GU products (the same that you can win below!) As you can imagine a sampler pack is anything but plain and bland. When I opened the package I found all kinds of flavors and products that I would never try on my own. I was excited to try some of them but I was a little apprehensive about some of the others. A couple weeks ago I ran with and tried some of these products for the first time, you can read more about what I tried and what I thought about it by going over and reading about that 13.1 training run. This past weekend I went back out for another couple long runs, one of them a 10 mile trail run, and the other a 15.1 mile road run. I took some GU for both of these runs, but used it very differently. On the 10 mile run I started off with some of the Chocolate Outrage which I have been a bit worried to use midway through a long run. I was pleasantly surprised how it tasted and that it didn't give me a heavy type feeling like I was expecting. I have tried many other flavors and even some from the Roctane line of products. I really don't know what all the differences are with the Roctane line, other than it is "GU to a higher power", I guess a bit more reading is in order. I have found all of them to be pretty good, although some of the flavors may disagree with me a bit at the 18 mile mark so I probably will be holding off purchasing any of those. I also received some of the GU Chomps which I have not yet had the opportunity to try yet. I am sure many of you are right in the middle of Marathon and Half Marathon training season as I am (I just recently committed to the Publix Georgia Marathon, and you can read more by clicking through to the announcement post.) What better timing than now for you to stumble across a giveaway for a GU sampler pack. You too can try out a Mixture of GU like I did. The giveaway will end on February 15th to make sure that none of you guys think you are going to win a GU pack to give to your sweetheart on Valentine's Day...... not that any of the GU products wouldn't say I Love You better than a box of chocolates! The winner will be chosen using random.org on February 16th. Unfortunately this giveaway is only available in the US and Canada. Check out the GU Energy website www.guenergy.com and check out their products. Stop back by and tell me what flavor or product that you would like to try that you haven't tried before. Write something on the GU Energy Fanpage wall. Mention this giveaway on your blog. If you actually mention it in a post and not just your sidebar this entry doubles to 2. ***Once you have done each of the above make sure you leave a comment here on the blog telling me what you have done. Thanks for stopping by my blog. Make sure you take the time to share this with all your favorite runners. You can even tell that runner next to you in your next race that they too could win by just searching for "26.2 Quest" in their favorite search engine. Stay tuned as I have a lot of great giveaways coming soon that I am sure you will not want to miss! -I haven't tried the Cherry Lime Roctane, but I'm gonna.. maybe tmw. -Follow GU Energy on Twitter and tweet your favorite flavor by clicking here - done. -Follow 26.2 Quest over there --> done. -"Like" 26.2 Quest on Facebook and write something on the fanpage wall - done done. -Follow me at @virtual4now and tweet this giveaway by clicking here - donedone! I haven't tried the GU Recovery Brew Lemon. "Like" the GU Energy Facebook Fanpage and write something on the fanpage wall.Check! "Like" 26.2 Quest on Facebook and write something on the fanpage wall. Check! Share this giveaway on Facebook doing an @ mention of 26.2 Quest. Check! Mention this giveaway on your blog. If you actually mention it in a post and not just your sidebar this entry doubles to 2. Check! -Funny that you posted this today. While I was out I bought a canister of orange-pineapple GU Recovery. I will be trying it over my next few weeks of training. -I like 26.2 Quest on Facebook. 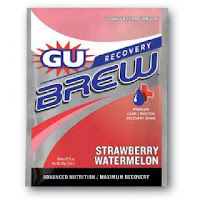 I have tried the GU recovery but would love to! I'd like to try the Strawberry Banana Gu gel. I've also mentioned my favorite flavor on Twitter and mentioned you on Twitter as well. I used 5 Jet Blackberry Gu's to get me through my first marathon and they seemed to work great! I follow and like all except Twitter. I'm not on Twitter. I used to have 4 GU Chomps (strawberry) before a race but they get stuck in your teeth! Can drive you crazy. During the race I'll have a GU every 4 miles, but make sure I hit every h20 stop along the way. These days I'm using Roctane (blueberry pomegranate) with 2x caffeine. I've also used espresso love and vanilla bean but the taste clash with gatorade isn't exactly a winning combo so i stick with with fruit-like flavors. On a 26.2 run that equals six packs of GU to carry, and I normally tuck three in each pocket. Can be a bit cumbersome (but what else can you do?) And someone recommended Honey Stinger instead of GU - have you tried it? I am going to give it a shot my next long run. Just wanted to mention that I changed the way the entries count because some of you were not doing it the way I had lined up. If I left it the way it was I was going to have to disqualify a lot of entries and I didn't want to have to do that. None of you will get any less entries than what you thought you were going to get, and some of you that did everything exactly right will actually get more than you thought you were going to get. If you go back and read it again you may actually have a chance at a few more entries than originally. Thank you everyone for the comments/entries so far, and Johann.... you are right, but I am leaving your entry in and if you win I will find something to do for you and then pick another winner. I hate for you and other readers of mine that these are not available outside the US/Canada. Sorry all for my confusion! I mentioned the contest in my latest blog post this morning. 1 - I would like to try the CHerry Lime Roctane and the new Gu Energy Brew Electrolyte tabs that come out in March. 1 - I'm looking forward to trying the new GU Energy Brew Electrolyte tabs and both of the new flavors. i would love to try the brew. I am a bit nervous to though buut I have liked everything else I have tried (which is only like 3 flavors of normal GU...) I want to try the roctane too!! I can't wait till the new Gu tabs come out in March!! 1- Shared the giveaway on my FB page! 1- Tweet "My fav Gu is Mandarin Orange! 1- Tweet about the giveaway. I am training for my first Half-Ironman distance event. I have come to depend on GU Strawberry Banana as my race energy source. I would love to try the following gels in the future: Chocolate Outrage, Tri-Berry, and Expresso Love. Thank you for such a wonderful an trusted product. I would love to try the Cherry Lime Roctane--sounds yummy! I love the vanilla bean gels--been using them for years. Wrote something on the GU Energy Fanpage wall. I am follower! What an awesome giveaway! I can't do gels, but I love Gu Chomps. Orange is my favorite. I liked 26.2 Quest on FB. I posted on the wall. I liked Gu on FB. I posted this challenge on FB. Thank you for this chance to win. I have performed all the social media tasks asked and even included this in a blog I just compiled and posted to both m personal facebook page, company facebook page and twitter account as well as to my website www.sandyaltman.com. I haven't tried the new Cherry Lime or Peach Tea. I wrote on the Gu Energy FB wall. I tweeted my favorite flavor. I wrote on your FB wall. I have tried a few of the Gu Gels. But I have never tried the Chomps, so I would like to try the Watermelon Chomps. I'd love to try the cherry lime rocktane! Ooh, I'd love to try the new rocktane flavors. I discovered the pineapple this summer and went through at least one full box during marathon training in the fall! I am a huge fan of gu, and I would love to try to cherry lime roctane! Sounds so good, usually I am a chocolate outrage kind of girl. I like vanilla bean, but the Cherry Lime could be interesting. Kinda sounds good! I like Gu on the FB. Shared on FB (on the new MvM page!). OK. Tweeted real quick. The link doesn't work for me on my work computer, so I had to recreate in TweetDeck. Hope it worked! So I'm super excited about the possibility of a sampler! I am in the process of training for my very first full marathon. I just tried my first GU's two weeks ago during my runs! I tried (and liked) the vanilla bean flavor...but I am interested in the Rocktane products, and any flavors of anything else EXCEPT pineapple. -I "liked" GU Energy and 26.2 on Facebook. -I tweeted my favorite flavor and the contest!! # Write something on the GU Energy Fanpage wall. this is an amazing blog- LOVE IT! •Write something on the GU Energy Fanpage wall. I am, as always, torn between Tri-Berry and Espresso Love GU. I follow you on Twitter (@NickiinNY). I follow GU on Twitter. I have retweeted your giveway. I really need to try the new cherry lime roctaine! Thank you all for the entries. The entries will be tabulated today and a winner chosen. Running Should Look Like It's Hard Work! Why Is My Thigh Doing This?